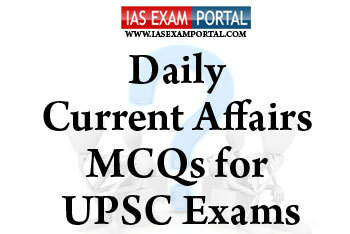 Current Affairs MCQ for UPSC Exams - 23 JANUARY 2019 | IAS EXAM PORTAL - India's Largest Community for UPSC Exam Aspirants. 1) Bihar and Andhra Pradesh emerged as the top growng states with State GDP growth far better than the national GDP growth. 2) But the gap between the per capita incomes in low-income and high-income States has been widening over the last five years. 3) While the FRBM Act had helped states recover their fiscal health considerably, recent trends show they are slipping. Debt ratios have risen in many States with the assimilation of UjwalDiscom Assurance Yojana (UDAY), farm loan waivers, and Pay Commission hikes. Q2. Which of the following statements regarding exercise ‘Sea Vigil’ are true ? 1) The exercise aims to simultaneously activate the coastal security mechanism across all States and Union Territories. 2) While smaller exercises are conducted in coastal states on a biannual basis, including combined exercises amongst adjoining states, the conduct of a security exercise at a national-level is perhaps the first of its kind. 3) The exercise also conducts scientific studies/assessments with respect to the declining coral reefs off the Lakshadweep islands. Q3. India’s rank in the global gender gap index 2018 is 108.With respect to the status of gender gap in the country, which of the following statements are true ? 1) In India the unpaid work done by women looking after their homes & children is worth 3.1 % of country’s GDP. 2) Women’s ability to take work is not merely determined by economic considerations but also by social norms as well. 3) Cutting taxes on wealth would in a large way address the issue of low purchasing power among women as more than 80% of women owned enterprises are self-financed. Q4. Which of the following statements regarding SansadAdarsh Gram Yojana (SAGY) scheme are true? 1) Under the scheme each Member of Parliament will take the responsibility of developing physical and institutional infrastructure in three villages by 2019. 2) A RajyaSabha MP need not choose a village from the state he is elected, while he can choose any village from any part of the country except his/her own village or spouse’s village. 3) It also has the objective to generate models of local level development and effective local governance which can motivate and inspire neighbouring Gram Panchayats to learn and adapt. Q5. Which of the following islands in the Andaman & Nicobar islands have been renamed as NetajiSubhas Chandra Bose Dweep commemorating his 122nd birth anniversary year in 2019.